A western themed video game leak fooled hungry Red Dead Redemption fans. A leaked screenshot yesterday took a Grand Theft Auto forum by storm when people thought it belonged to Rockstar’s Red Dead Redemption 2. However, an exclusive reveal from PC Gamer pulled the wool over fans’ eyes when it turned out to be part of a western-themed MMORPG called, Wild West Online. 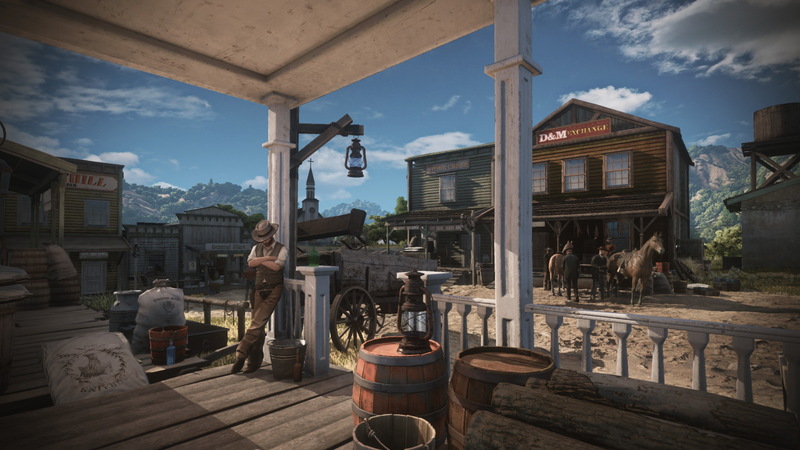 The leaked screenshot showed off a cowboy standing with his hat tilted down, and leaning back against the entrance of an old timey, wild west building. The cowboy image--by virtue of being a cowboy in the year of Red Dead Redemption 2--quickly got mistaken for Rockstar’s western sequel, which is already one of the most anticipated games of the year. However, PC Gamer put those rumors to rest when it helped announce Wild West Online, an MMO that does in all honesty bear a striking similarity to Red Dead Redemption. I think that alone should actually be considered a compliment given how fully-realized Wild West Online looks. Red Dead Redemption is essentially the definitive western video game, so in that regard, even being considered to be something that could be Red Dead Redemption 2 is a huge accomplishment. And although some internet commenters expressed frustration that Wild West Online isn’t the game they wanted, others have expressed pleasant surprise over another good looking western game coming out this year. Reddit and NeoGAF threads that jumped on the screenshots yesterday woke up to the new reality that there would be more than one cowboy video game to pay attention to, with plenty of diverging opinions regarding Wild West Online's reveal. "Well, they got tons of free advertisement with just one screenshot. Shows how hungry people are for RDR 2 info[,]" wrote Topsbaby on a Reddit thread. "I, for one, would love to see this game do nicely[,]" replied another commentor on the thread. "Well that's the opposite of what I want[,]" says another Redditor. In Wild West Online, players can choose to either be cops or criminals as they try and eke out a living in the old frontier. Players can rob banks, stop crime, claim land, and basically live out the cowboy life they’ve always dreamed about. Wild West Online developers expect to launch a Kickstarter at the end of May with the goal of $250,000, along with stretch goal tiers. The core game is already in development while additional funding will go into further development. The game is still expected to release later this year regardless. Tagged with mmorpg,	News,	PC,	Rockstar Games,	Wild West Online.